If you are not sure about the ring design your partner would prefer, why not think about the option of loose diamonds? The diamond you choose is a beautiful symbol of your relationship and your intentions. 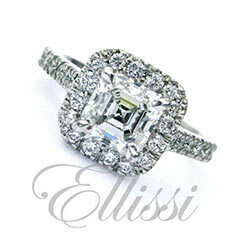 Ellissi stocks and imports a stunning range of loose diamonds, we hunt the world over to find then best possible result for each and every ring we make. It can then be placed in and secured behind glass, in one of our specially made display boxes, then given, to start the process on ring design when you are ready. Designing your engagement ring with our jewellers is a wonderful experience. Couples really enjoy the time they spend together creating something that is important to their relationship. Once the detail of the design is worked out, our jewellers hand craft the ring for you. The ring is made especially for you using the diamond you have chosen. Having your ideas incorporated into the design makes the ring just that bit more special. And of course the ring is unique to you! Loose diamonds come in all shapes and sizes, so having some idea of what you or your partner likes is the starting point. And of course you will need to consider what your budget will be. By far the most popular diamond shape is the Round Brilliant Cut diamond. Being round, it is enormously versatile and can be used in may designs. Cushion Cut diamonds and very traditional cuts such as the Emerald Cut diamond are also highly sought after. Recently, we have seen a great demand for oval cut diamonds too. These cuts really look great in a Halo Cluster design, a design that continues to enjoy a resurgence in popularity. Choosing a loose diamond gives you the best chance to purchase a superb diamond for your partner at a great price. When you buy a ready made ring, you don’t have a lot of choice in the diamond selection. The diamond may not be the best that you can buy for the budget you have. When you buy a loose diamond, you can really focus on the qualities that are important in diamond selection. Choosing a great diamond requires a great deal of expertise. At Ellissi, we make a point of educating you along the way. This is an important part of the process. You will understand exactly what it is you are paying for. Your diamond will shine in a beautiful Ellissi presentation box. Our diamond boxes are made especially to show the diamond off. Every diamond is accompanied by its GIA documentation. This is presented in a Ellissi diamond document folder. How you actually propose…well that’s up to you! But we can give you some ideas on that too, if you really need them.